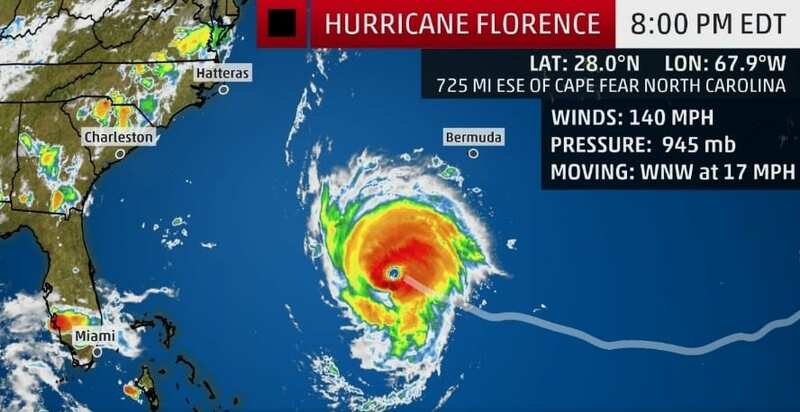 As Hurricane Florence makes her trek towards North Carolina, predictions are that she will make landfall in the southern area of the state. It is anticipated that she will cause extensive damage to the communities in her path, and United Airlines is offering its customers options as Florence looms. The hurricane has been growing in size and gaining strength, now categorized as an extremely dangerous Category 4 hurricane. Landfall is expected on Thursday and into Friday, although nature will decide what track Florence finally takes. Wherever she goes, she will bring catastrophic flooding, destructive winds. For the most up-to-date news, announcements and travel updates about United service to airports in the Mid-Atlantic, customers are encouraged to visit united.com and on United’s social media channels including @United on Twitter and United Airlines on Facebook. United’s customer service teams are proactively reaching out to customers with reservations during the forecasted impact time and rebooking them on alternate flights. Customers may check flight status and change travel plans quickly and conveniently via the United app, and on united.com. Customers who require rebooking or customers without reservations should not go to the airport. United is encouraging customers to call 1-800-UNITED-1 for help rebooking travel. The airline encourages customers who do not have immediate travel plans to call at a later date.